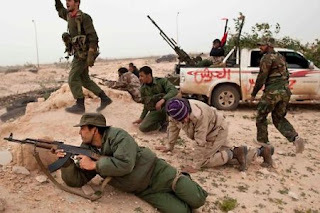 Ajdabiya a major oil producing town in eastern Libya has come back in the control of the rebels, who have been fighting against the Libyan Leader Col. Muammar Gaddafi. 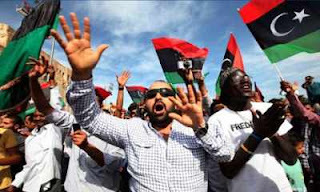 Situated 160 Kilometres south of Benghazi where another struggle between Libyan troops and rebels is going on.The city of Ajdabiya was captured by Gaddafi forces last week. Several hundreds of troops accumulated in he morning before marching in the city. 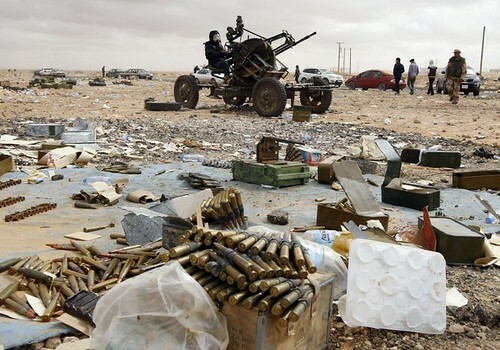 Having lower quality and lighter weapons than the Libyan government troops, these rebels managed to get back the hold on the city just with the help of some Kalashnikov and knives. While tanks were guarding western and northern entrances to the city, rebels entered the city from several fronts and got within one kilometre to the city’s eastern entrance, because of huge engagement of regime loyal forces in the northern region of Libya by Western forces. In Benghazi, rebel military council spokesman Ahmed Omar Bani told AFP: “We are trying to negotiate with these people (Gaddafi troops) in Ajdabiya because we are almost sure that they have lost contact with their headquarters.” adding further: “Truthfully some of the Ajdabiya militias have asked to surrender, to be left alone and to go back home. But we cannot leave them to go without interrogation because the answers we get from them will be useful in saving lives.” Mr Bani further told the media that the rebels were communicating with the troops through a sheikh in a mosque in the city.